Critics found it difficult to define the genre of this book. The author calls it autobiography, but distances himself from the idea of a "memoir"; readers tend to see it as a novel. It retells the dramatic events that took place in Bulgaria during the last century: a war, the consequent invasion of the country by the German and the Soviet armies, replacement of the political regime, collectivization, peasant revolt, economic deadlock, then yet another regime change. It is a first-person narrative, the world seeing through the eyes of a child, then a teenager, a young man and, finally, an adult. Against the backdrop of major social collisions we see the molding of a person: grotesque moments from childhood, collision with the dominant ideological postulates during adolescence, first sexual experiences retold with great irony, political delusions and insights. "With an exquisite sense of humor, erudition and sincerity, Konstantin Iliev returns in time the way an anthropologist might, exploring human relations not in alien countries, but in times that are now alien, retelling what his eyes have seen. In 2003 "The Defeat" received the prestigious Helicon award for new Bulgarian fiction and the Elias Canetti Literary Prize in 2005. The Defeat is a deep and wise book – a balance-sheet not so much in a personal sense, but rather in the sense of the communal fate, a balance-sheet which begins with hope and ends with failure. 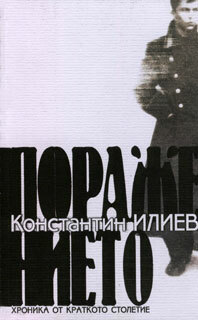 In times when the majority of memoir books (and there is a great abundance of such) are full of insolent lies or well groomed half-truths, cynical falsifications or slightly more refined beating around the bush, ridiculous repentance or comical rewrites of biographies, Konstantil Iliev's The Defeat stands valiantly face to face with the cruel historical truths and accepts them with no make-up.